We were eager to relieve our worn-out bodies from an almost three-hour wobbly travel from Tagbilaran City to Carmen, and back. The muscle pains needed to be shrugged off and our minds were already focused on having a reward after the very tiring day we had. 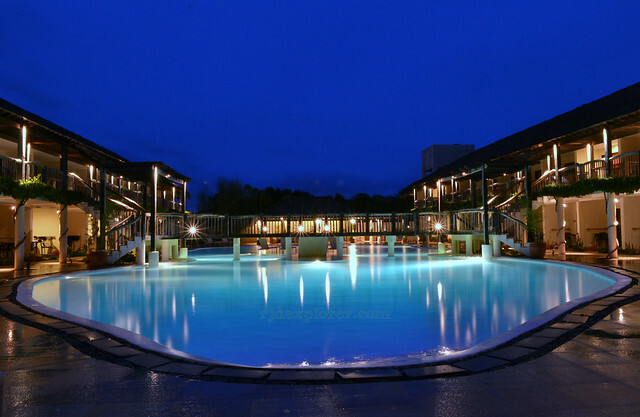 Blue hour at Bluewater Panglao’s main pool. Finally, we reached our destination that day and arriving at the beach resort’s lobby and viewing the pool gave us the idea of how great the next few days in Bohol will be spent. 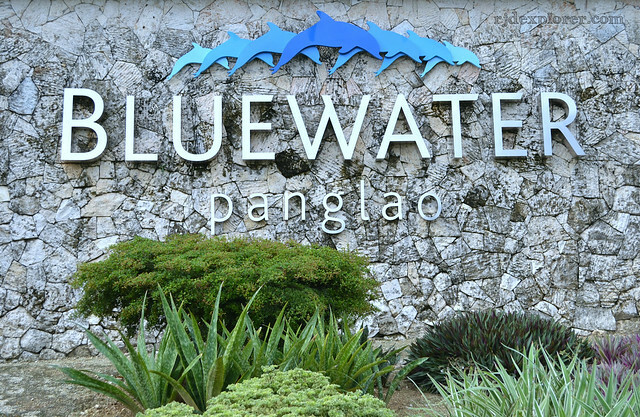 Bluewater Panglao was designed to create a lavish escape that honors Bohol’s natural beauty. The resort is comfortably located on an island with white-sand beaches, perfect waters, and marine sanctuary. Main pool has numerous lounge chairs. A staff welcomed us immediately after we got down from the shuttle service and offered to take our bags. Another staff approached us and offered a cold towel and welcome drinks. And since we came from an exhaustive day, the cold towel and the invigorating Lemon Grass tea really refreshed us up. First impression lasts and that gesture really indicated a worthy visit in Bluewater Panglao. View of having a Deluxe Pool View rooms. The ever-smiling staff on the information desk handed us our room keys without delay and we were on the doorsteps of our Deluxe Poolside Room afterward. 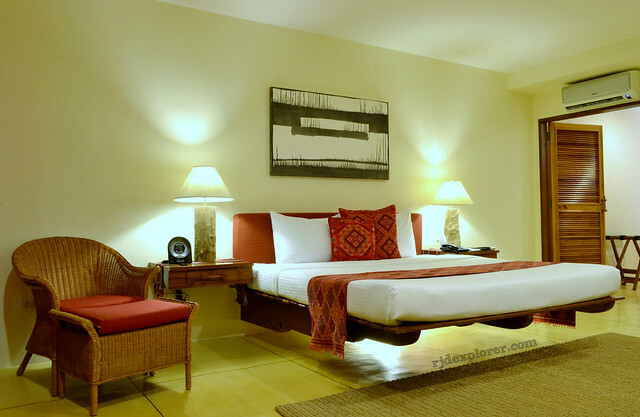 The resort’s Filipino architecture and design are very evident by them utilizing indigenous materials to adorn the interiors of the rooms. Bluewater’s signature “hanging beds” were the first to grab my attention, plus the freestanding tub that can be seen when the doors of the bathroom are open. 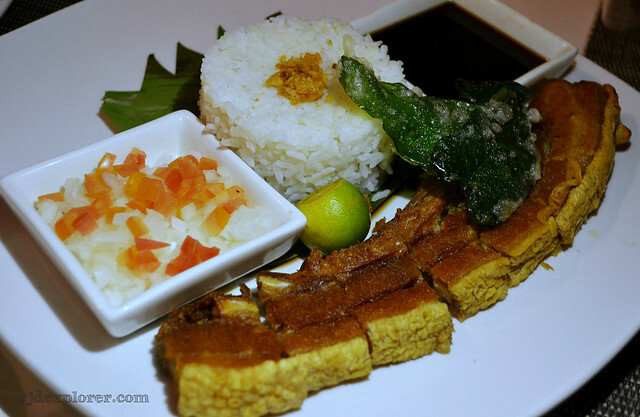 Very Filipino and warm vibe of Aplaya Restaurant. Sun already set but Bluewater Panglao still has to offer. We were lucky to be in the resort on a Saturday night because of a cultural and dining extravaganza entitled as Barrio Fiesta where guests can enjoy a colorful and upbeat Philippine cultural dance show while feasting on Filipino cuisines. Applauded segment was when the dance group performed a faster version of Tinikling with the dancing pair blindfolded. 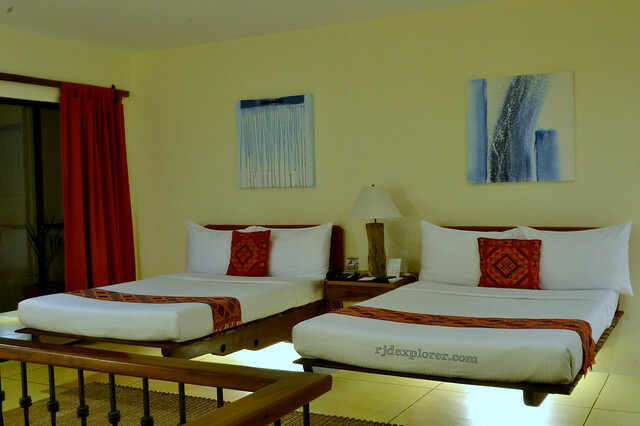 Our room for three days in Bluewater Panglao. A long first day in Bohol was ended with a great shower at the spacious bathroom of our room. 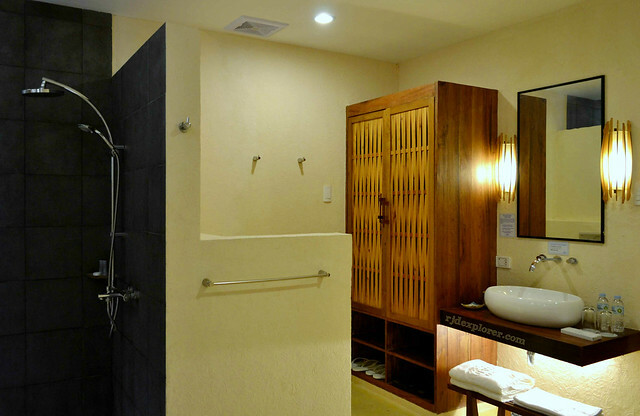 It is almost as half as the bedroom with the tub as the main feature, and overhead shower. 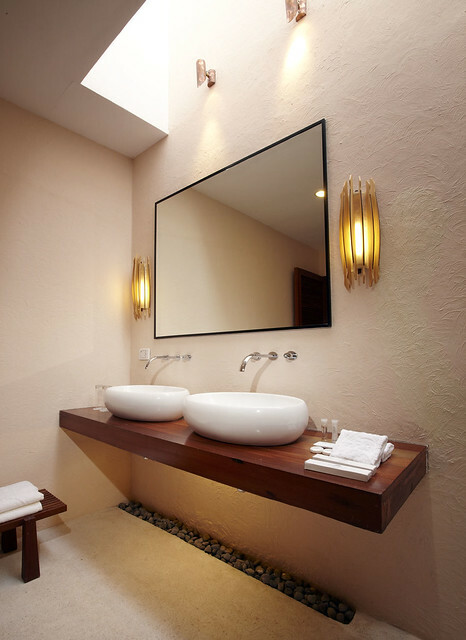 Usual toiletries are present such as shampoo, soap, dental kit, slippers, and (body, face and foot) towels. 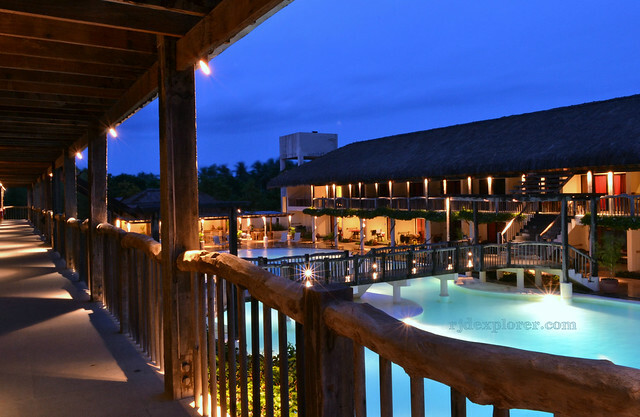 The resort is made up of different levels of accommodation from premier rooms, lofts and villas with a take on Filipino architecture and design that complements Bohol’s culture. Each comfy rooms has the usual complimentary amenities such as WiFi, flat-screen TV, mini-bar, coffee/tea service, private veranda, iPod dock, and the list goes more and more. Family loft with two-storey accommodation. King size bed on the first floor and 2 Queen beds on the upper one. 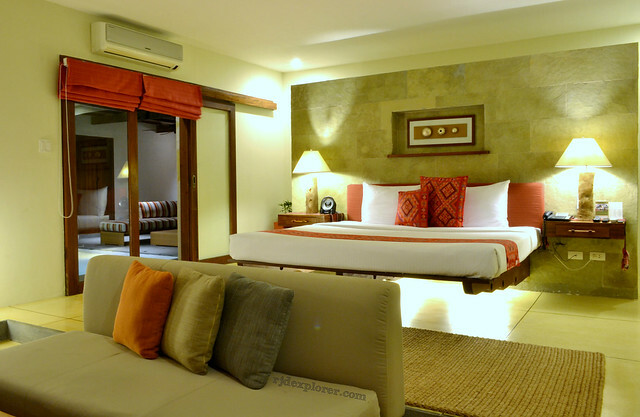 The Deluxe Rooms that surrounds the main swimming pool have either king bed or 2 queen beds and a separate spacious shower and bathtub. 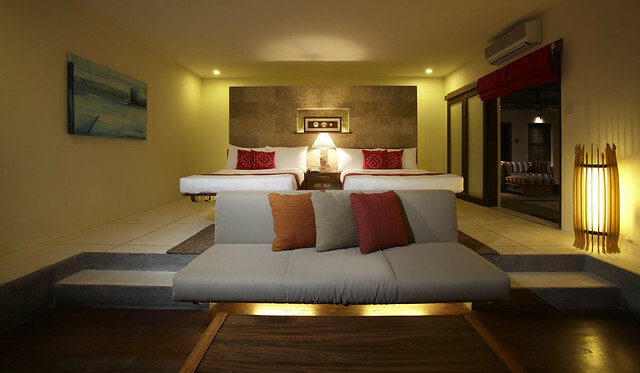 On the other hand, Family Lofts located at the rear part of the main pool are similar to the Deluxe but offers a two-storey accommodation, King Bed on the lower floor and 2 Queen Beds on the second. But the real deal is the list of perks that come with the room which also includes daily buffet breakfast at Aplaya Restaurant, and fresh fruits upon arrival. 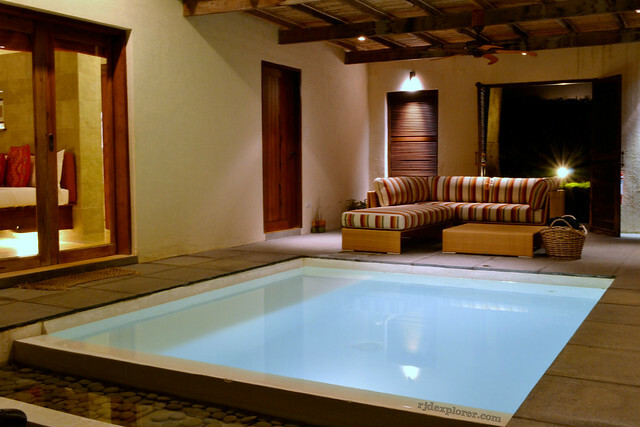 Additional perks of availing a villa: private dipping pool and more spacious bathroom (with vanity mirror). Three Honeymoon Villas (1 King Bed) and a Family Pool Villa (1 King Bed and 2 Queen Beds) all situated near the resort’s garden, enjoy the same services, with the added luxury of having their own lanai, a private dipping pool, and espresso machine services. 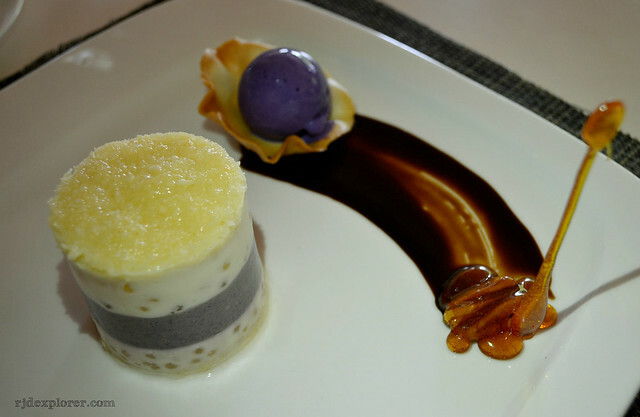 At meal times, Aplaya Restaurant offers international cuisine and authentic locale gastronomy with a touch of Filipino-Asian fusion with ingredients featuring exotic flavors made from local products. 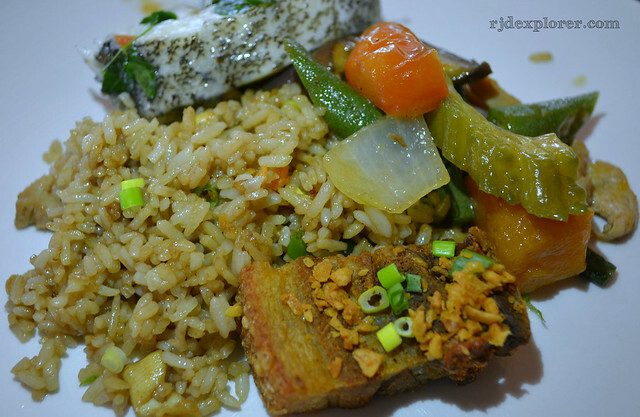 Filipino favorites: Lechon Kawali (left) and Adobo Rice with Lechon Kawali, Pinakbet and TInolang Pugapo. 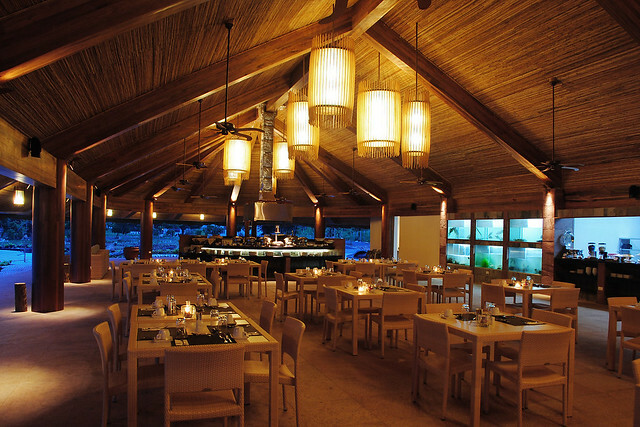 Overlooking Bohol strait, the al fresco dining ambiance adds up to the flavors of the food being served: from appetizers, soups, signature Bluewater salads, Filipino staples, entrees, pastas, sandwiches, sweet treats, coolers, and of course, fresh seafood. 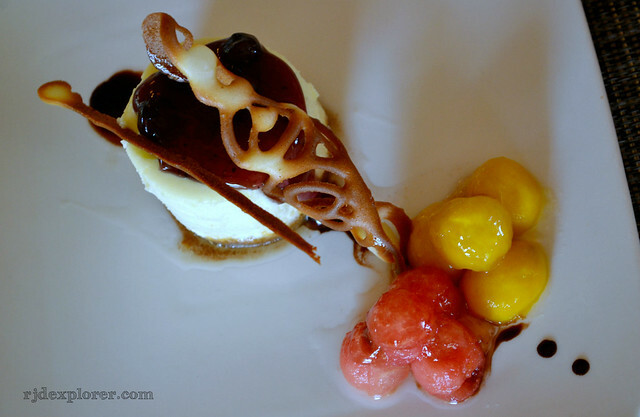 Sweet treats: Blueberry Cheesecake with Mango and Watermelon Coulis, Boholano Ube Kinampay, and Carrot Cake and Panna Cotta. For refreshing cocktails, cold beverages and light snacks, Baroto Poolside Bar near the main pool is definitely the place to be. You can enjoy your favorite drink until 10 in the evening. 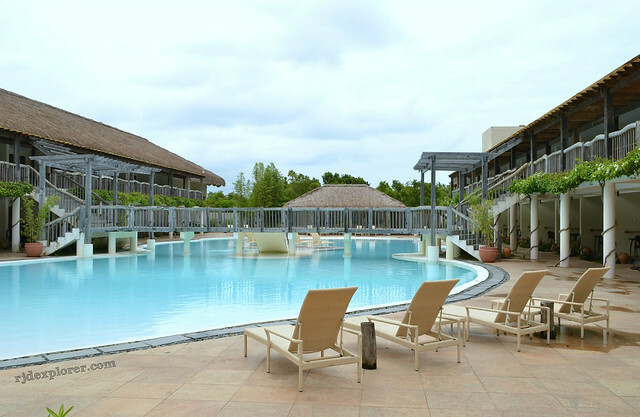 With your desire to spend more time inside your rooms and stay on bed all day, other recreational activities of Bluewater Panglao will obstruct you in doing this and the two free-form lagoon-shaped swimming pools are one of these things. The stay includes complimentary but limited use of non-motorized water sports facilities such as kayaking, paddle boarding, and catamaran ride. Infinity pool situated near Aplaya Restaurant. The resort has available bikes and ATV units that you can rent per hour and they can also assist you on setting up a diving, snorkeling, glass bottom boat cruising, island hopping, and wind surfing activities. 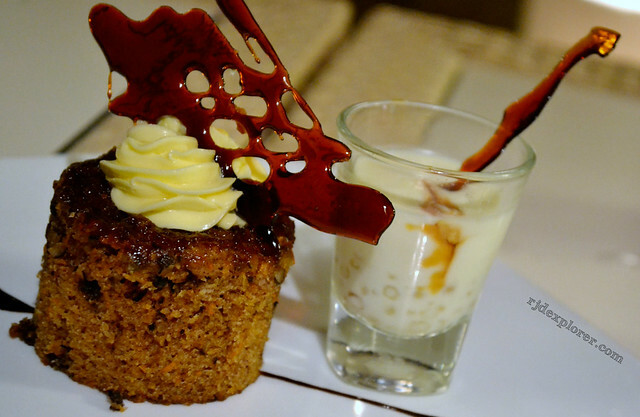 In search for a posh place to indulge, there are really things you look-forward to that will make your experience more enjoyable: exclusive facilities and amenities, peaceful surroundings, and sumptuous dining options, and Bluewater Panglao let you experience these. 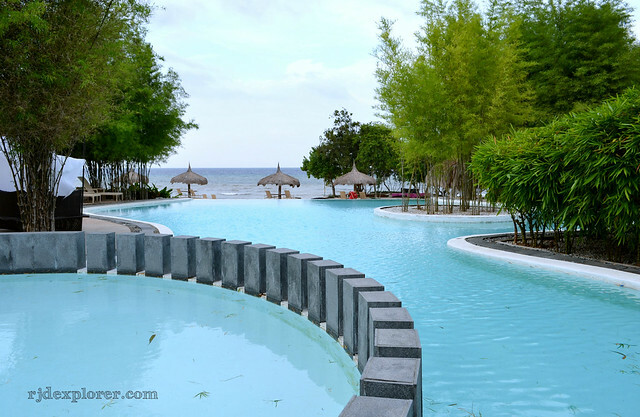 BLUEWATER PANGLAO BEACH RESORT is clearly a spectacular place to relax and call home after a long day of exploring the province of Bohol. 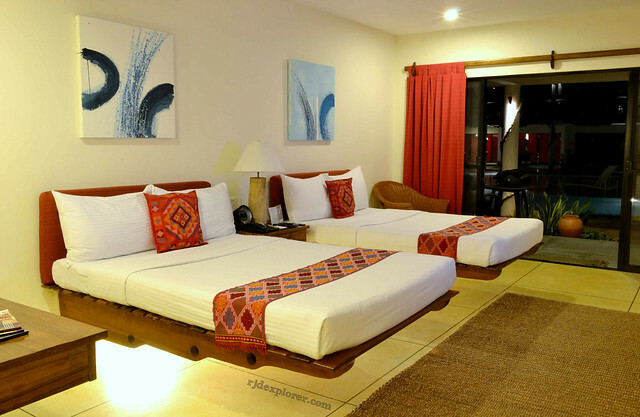 Book that dream vacation in Bohol and enjoy discounted rates at Bluewater Panglao Beach Resort here.